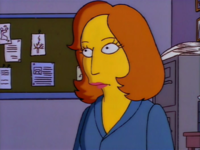 Dana Scully is an FBI Special Agent and is partnered with fellow Special Agent Fox Mulder. Mulder and Scully work out of a cramped basement office at FBI headquarters, investigating unsolved cases labeled "X-Files". In contrast to Fox Mulder's credulous "believer" character, Scully is the skeptic, choosing to base her beliefs on what science can prove. However, occasionally Scully is exposed to similar "unbelievable" events which Mulder does not believe in, and the tables are turned. When Homer believed that he saw an alien, Mulder and Scully came to Springfield to investigate. They interviewed Homer and put him through a series of medical tests. When Mulder questioned why Scully had Homer running on a treadmill in his underwear, Scully replied, "I just thought he could stand to lose a little weight." After watching for a moment, Mulder said that Homer's jiggling was "almost hypnotic", and Scully agreed: "It's like a lava lamp." They next had Homer walk through everywhere he'd been the night of his sighting, finishing with the place in the forest where he'd seen the "alien". When the only thing they saw in the forest was Grampa, Scully described the Springfield investigation as "the worst assignment we've ever had" and left, figuring that Homer was crazy. She later reappeared wearing a "Homer is a Dope" T-Shirt and singing "Good Morning Starshine" along with a large crowd of Springfieldians. 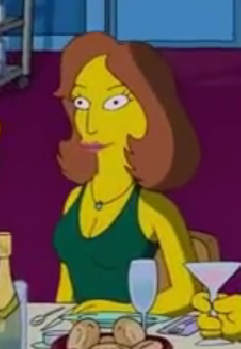 A picture of Dana Scully was seen on the wall of Springfield Sardi's. Dana Scully is element Ds in Lisa's Table of Geeky Delights. She was seen at FOX's 25th Anniversary show. Dana Scully is one of the main characters on the Fox drama series The X-Files. She is played by Gillian Anderson. Former executive producer Mike Scully claims that he used to get a lot of fan mail that was sent to the Fox network addressed to Dana Scully. Dana's name is a combination of the names of two producers: Dana Gould and Mike Scully. Modified on October 10, 2017, at 10:36.